Rather than focusing on its water's purity or using dull words like hydration, Aquafina's new campaign aims to associate the brand with "the feel-good moments that water brings your body after consumption," according to parent company PepsiCo. 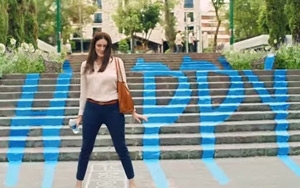 The "For Happy Bodies" campaign is the first in seven years for the base Aquafina product. Mekanism is the lead creative agency. A 30-second spot launching today in select markets, which will also air nationally for two weeks in early July, features young adults and kids frolicking in a park, to a remake (by the band The Goods) of the Partridge Family theme song "Come On Get Happy." Other elements of the campaign include radio spots (to air for eight weeks); social media; digital advertising; out-of-home; and a sweepstakes with the Living Social deals Web site. Aquafina also participates in the Partnership for a Healthier America's "Drink Up" campaign. On July 1, the brand will sponsor a morning dance party thrown by the Daybreaker organization in New York City's High Line Park to benefit the park and Drink Up charities.